Joy Clendenning, managing director for Raise your Hand for Illinois Public Education, presents during a workshop for local school councils. The workshop, called “Empowering Southside LSCs-Transforming Communities,” was held Saturday, October 13 at Ellis Park, 3520 S. Cottage Grove Ave.
Photo Above: Brenda Delgado, board member of Raise Your Hand for Illinois Public Education (right), shares a laugh with Jeanette Taylor, a local school council facilitator, before a workshop they held for local school council members on October 13. The workshop was supported with a $2,500 Acting Up award from The Chicago Community Trust. Photo Above: Cassandra Bogan (left) of King College Prep’s Local School Councils and Chinata Jones Howard (right), a teacher at South Shore International College Prep, react to Jeanette Taylor’s presentation at Raise Your Hand for Illinois Public Education’s recent training for local school councils. As guests streamed into the Ellis Park community center, a quaint familiarity swelled in the air. They greeted one another and helped themselves to a spread of fresh fruit, assorted breakfast sandwiches, donuts and coffee before settling in. Women from all walks of life gathered on this brisk Saturday morning—mothers, teachers and community members—all to learn more about the power of local school councils. 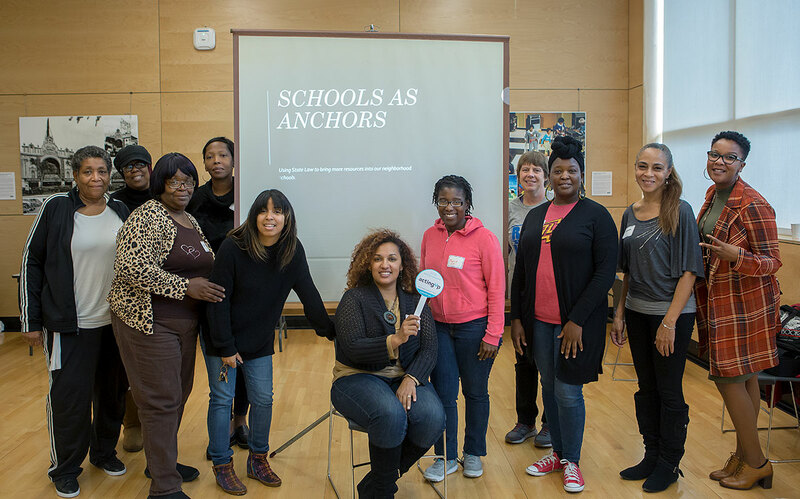 The “Empowering Southside LSCs” workshop was the second training hosted by Raise Your Hand for Illinois Public Education with support from a $2,500 Acting Up award from The Chicago Community Trust. In total, the Trust awarded $150,500 to 37 projects that will support tangible activities to benefit neighborhoods and public good. 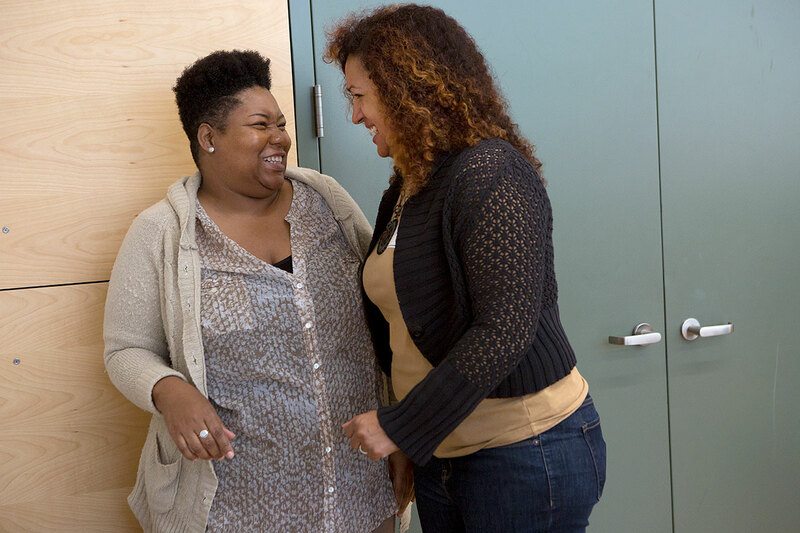 These ideas were sparked through the Trust’s fifth annual On the Table, an initiative that brings Chicago-area residents together for mealtime conversations to develop new relationships and inspire action that makes a difference in our communities. At her On the Table discussion, Raise Your Hand for Illinois Publication Education board member Brenda Delgado realized the impact of local school councils while discussing what’s missing from public education. “With all of this conversation about public education, what are we going to do afterwards?” said Delgado. “The community needs to keep coming together and talking about their own issues and then empower them [community members] to actually take action. If they know what kind of power they have, they could solve their own problems.” This is a key reason why Raise Your Hand for Illinois Public Education hosted their training sessions for local school councils. Established through the 1988 Chicago School Reform Act, local school councils consist of parents, community members, teachers, school staff and the principal elected to manage school operations. The collaborative process is governed by its own set of bylaws that can prove difficult to understand. These training sessions confronted this challenge by covering fundamentals from how to conduct principal evaluations to decoding state law. 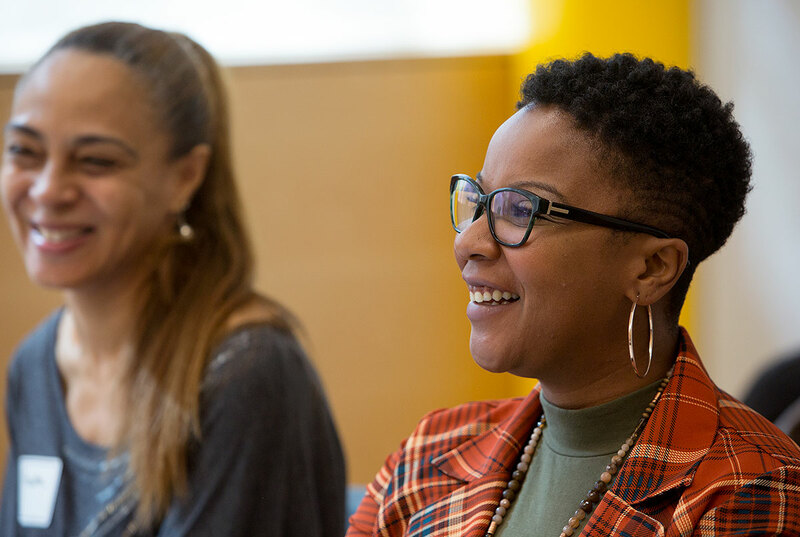 Jeannette Taylor, workshop facilitator, said these trainings are important because she served passively on a council for five years before being empowered by a training hosted by the Kenwood Oakland Community Organization. 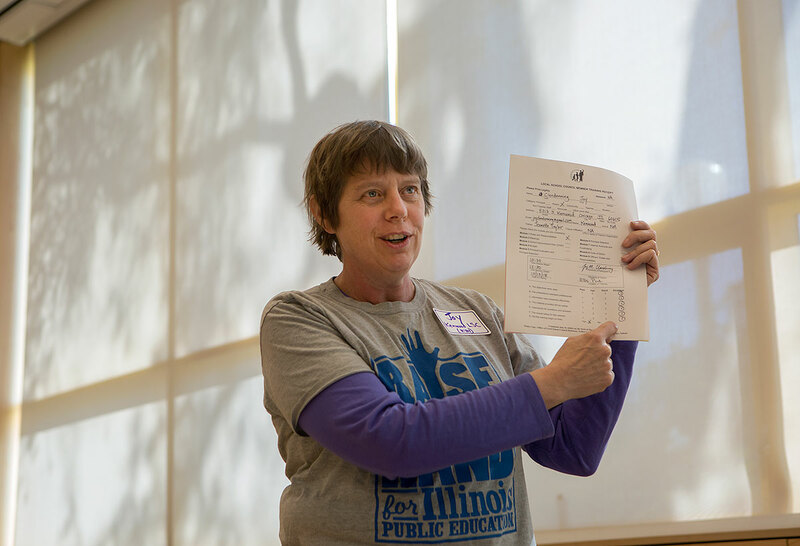 Joy Clendenning, managing director of Raise Your Hand for Illinois Public Education, describes an evaluation form during a training she organized for local school council members on October 13. Photo Above: Participants of the “Empowering Southside LSCs” workshop, sponsored by Raise Your Hand for Illinois Public Education, on Saturday, October 13. “Through that training I became a better member on the LSC to the point where I asked my pastor to join (the LSC),” she said. Taylor went on to serve as parent organizer for the organization. At Raise Your Hand’s workshop, the agenda quickly went off script as impromptu issues about budget approvals and rallying new members to meet LSC voting quorum were voiced by attendees from schools that included Kenwood Academy High School, Nicholson STEM Academy and King College Prep. “At this point, any information is helpful,” said Cassandra Bogan a parent on King College Prep’s local school council. Bogan was elected to the council in April 2018, after moving to Chicago from the suburbs to afford her daughter better school options. Participants in the workshop were eligible for official credit for the “Roles and Responsibilities of LSCs” training module required of all council members. With each of the two sessions hosting eight to 10 guests, Joy Clendenning, managing director of Raise Your Hand for Illinois Public Education, noted that the smaller groups made for a much more intimate conversation and served as a catalyst for more to come.